There are several options in Costa Rica for kiteboard and kitesurfing lessons at all levels. You’ll want to choose the site that fits your needs best and browse through the different instructor options available though, as prices, availability, and style vary significantly from place to place. Renting equipment is easy at any of the top spots. You’ll find major brands like Cabrinha, North, Best Kiteboarding, Slingshot, Liquid Force, and other major and smaller brands. 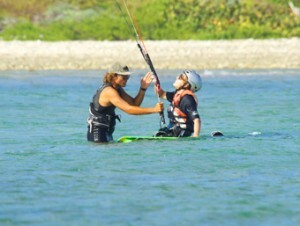 Check out our listing of kitesurf instructors currently based in Costa Rica. Although there are other options for lessons, you’ll find these are the top instructors, with their own equipment and setup. They often have assistant instructors or local riders helping out for the season between November and May. No matter whether you’re just getting started with your first kite lesson or looking for some help with new tricks, you have several options for kitesurf schools, instructors, and spots. You can choose your preferred place to kitesurf, whether it’s fresh water on the lake and salt water on the bay, and then review the instructor options for different styles of teaching and certifications. 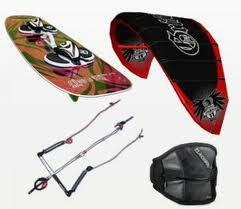 There are several options for buying brand new kitesurfing equipment in Costa Rica. They’re not really accessible in the city, but rather at local kiteboarding spots on Lake Arenal and in Bahia Salinas in northern Guanacaste. You can also find kitesurfing gear for rent or used gear at discounted prices, from previous seasons and from traveling kitesurfers.